Primitive neuroectodermal tumour (PNET) of the spine or peripheral Primitive neuroectodermal tumor (pPNET) has been recently classified as Ewings sarcoma family of tumours (ESFT) along with Ewings sarcoma (ES) and extra-skeletal Ewings sarcoma (ESS) due to their developmental, biological behaviour, and histological similarity including expression of glycoprotein p30/32 (CD99). PNET of spine has a poor prognosis similar to their cranial counterpart Primitive neuroectodermal tumour (cPNET) even after radical excision and adjuvant radio-and chemotherapy. Detailed study of its molecular pathogenesis and development of immunotherapy is the need of the hour to improve its outlook. We describe an interesting case of sacral PNET in a child and its dismal outcome even after adequate therapy. A 9-year-old male child presented with retention of urine and constipation for last 2 months, low backache radiating to posterior aspect of both thighs for 1 month and weakness of lower limb for which there was difficulty in walking. Sagittal magnetic resonance imaging (MRI) of lumbo-sacral region after contrast showed a long segment mass lesion occupying the spinal canal from S1 to upper border of S5 with intense enhancement [Figure 1]a. Coronal image of the lesion showed it to come out of the spinal canal through multiple sacral intervertebral foramina indicating its infiltrative potential [Figure 1]b. In axial image there was no invasion of vertebral body [Figure 1]c. Multiple sacral laminectomy and complete excision of the lesion was done along with its foraminal extensions. The lesion was found to densely adherent to some of the sacral nerve roots and these were sacrificed for radical excision. 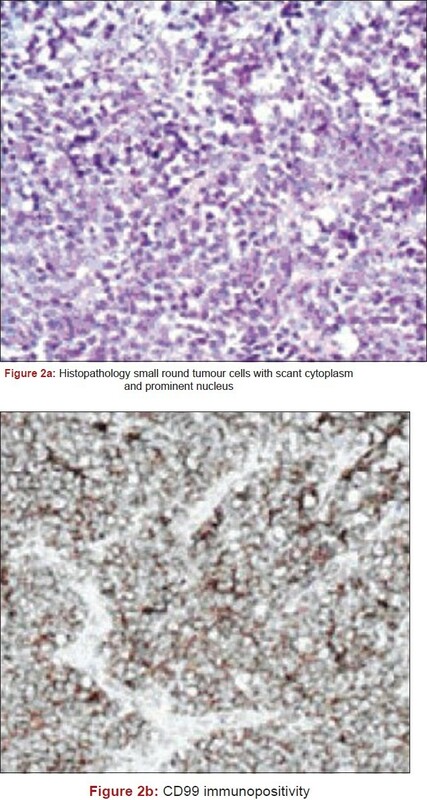 Histologically, the tumour cells were small and round morphologically, arranged in groups, with hyperchromatic nuclei and scanty cytoplasm and showing CD99 immunopositivity suggestive of PNET [Figure 2]a and b. Post-operatively patients' pain diminished and the motor power in lower limbs improved. However, the urinary retention continued and the patient discharged with a catheter. Patient received radiation therapy followed by six cycles of chemotherapy consisting of cyclophosphamide, vincristine, and carboplatin. Radiation therapy consisted of reduced-dose craniospinal RT (23.4 Gy) and a 32.4 Gy boost to the sacral area. Doses of Cisplatin, vincristine, cyclophosphamide were 75 mg/m 2 , 1.5 mg/m 2 (maximum dose, 2 mg), 2 g/m 2 of body surface area respectively. Six months later patient presented with worsening of motor function with the power in both lower limbs being 2/5 and the patient being bed-ridden. Urinary functions had never improved in this period. MRI of sacral region showed a large exophytic growth growing out of the sacral canal both anteriorly and posteriorly almost destroying the sacral vertebrae. Anteriorly the lesion had breached the presacral space and had almost filled the pelvis. Posteriorly the lesion had grown so extensively that it came to lie in subcutaneous space [Figure 3]a-c. Chest X-ray showed multiple round opacities suggestive metastases. Patient died of pneumonia and inter current infections within next 1 month. Primary PNET primitive neuroectodermal tumour of spine are rare and are much less frequent than the secondary ones which arise as a result of drop metastasis from the cranial primaries particularly at cervical region. Our case had normal computed tomography (CT) scan of head and the sacral position is quite rare a position for drop metastasis. Clinically, the patient had a short history of 2 months and early bowel, bladder involvement, suggestive of a malignant intramedullary lesion. Radiology showed the lesion to arise from nerve sheath because of sacral position, relationship with the nerve roots, and extensions along the intervertebral foramina. After radical excision, patient received full dose adjuvant radio-and chemotherapy, as the histology was suggestive of PNET, which is a WHO grade IV lesion. However, the patient had early recurrence at local site and distant metastasis due to its highly aggressive malignant behaviour. Few cases of sacral primary PNET/Ewings sarcoma ES have been described in the literature. ,,, At the present scenario, optimum therapy of radical excision followed by full dose radio-and chemotherapy does not appear to be adequate for this group of highly malignant primitive tumours. Adjunctive immunotherapy has been investigated as a possible therapy. Study on molecular pathogenesis of these tumours and and their application through immunotherapy is the key to future advancement in treatment, which is currently lacking. 1. Musahl V, Rihn JA, Fumich FE, Kang JD. Sacral intraspinal extradural primitive neuroectodermal tumor. Spine J 2008;8:1024-9. 2. Narula MK, Gupta N, Anand R, Kapoor S.Extraosseous Ewing's sarcoma/primitive neuroectodermal tumor of the sacral nerve plexus. Indian J Radiol Imaging 2009;19:151-4. 3. Virani MJ, Jain S. Primary intraspinal primitive neuroectodermal tumor (PNET): A rare occurrence. Neurol India 2002;50:75-80. 4. Yavuz AA, Yaris N, Yavuz MN, Sari A, Reis AK, Aydin F. Primary intraspinal primitive neuroectodermal tumor: Case report of a tumor arising from the sacral spinal nerve root and review of the literature. Am J Clin Oncol 2002;25:135-9. 5. Virani MJ, Jain S. Primary intraspinal primitive neuroectodermal tumor (PNET): A rare occurrence. Neurol India 2002;50:75-80.